Do you hate plastic bags as much as I do? I have a serious vendetta against them. If I'm walking down the street and see someone carrying something easily portable in a double layered plastic bag, I feel my heart rate increase. Or if I'm in line at a store and someone picks up something that's already in a bag, and requests another few bags to put around that bag. I realize there are situations where you're without a bag and have no choice but to take one--I've been there, too, of course. If the choice is paper versus plastic, I'll always choose paper. Paper can be recycled or re-fashioned into wrapping paper, while plastic clogs landfills, will never biodegrade, and is made from petroleum. I try to eliminate the choice of paper versus plastic by just bringing my own bags. And if I'm making an impromptu purchase and don't have a bag, I'll often receive 'are you crazy looks?' because I just carry whatever it is I bought or stuff it into my trusty tote bag. For those times at the farmers' market or the grocery store when I need to bag small or delicate items (beans, blueberries, tomatoes, etc), I use these bags. They're versatile, washable, and always carry more than they look like they should. 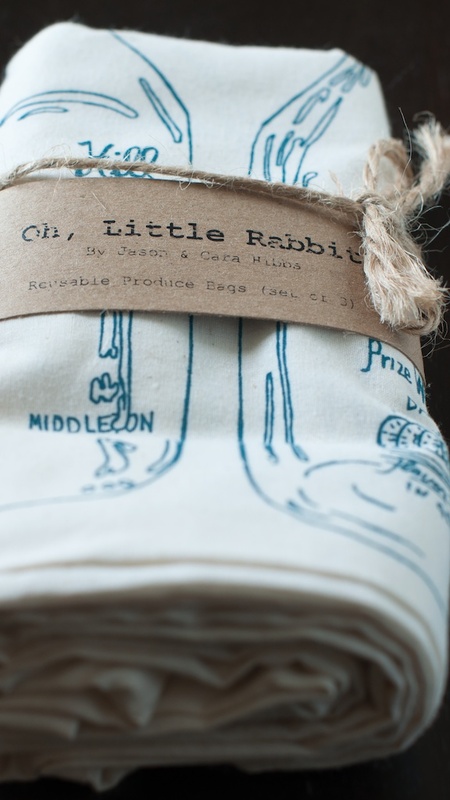 I also recently purchased these produce bags from Oregon based Oh Little Rabbit. 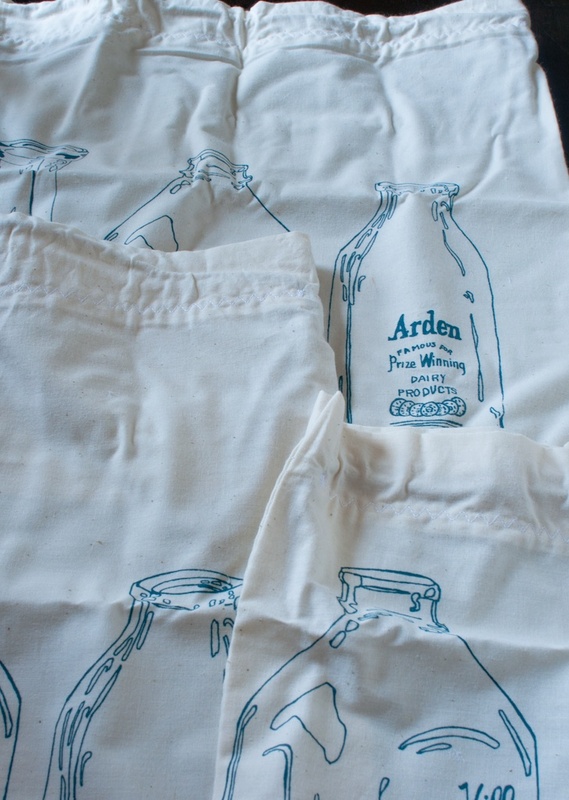 I may have mentioned before that I keep a special stack of tea towels for photos or guests (but never for scrubbing the counter!). These gorgeous produce bags have ended up stacked in the tea towel pile because I wanted to keep them pristine. I just haven't been able to bring myself to sully them with dirt and food stains. Recently, I've had a change of heart. Keeping the tea towels clean serves several purposes: besides photography, it's always pleasant to have a pretty tea towel layered under a tray of cookies or a pie. But these bags serve no purpose if they're just tucked away and lovingly looked at from afar. They're meant to be used. The last thing I try to promote on this site is hoarding or consuming for the sake of consuming! So I'm removing the bags from their safe little drawer and bringing them out into the open…tomato stains, dirt, and all. The plus is that I can always purchase new bags if these originals become too dingy. 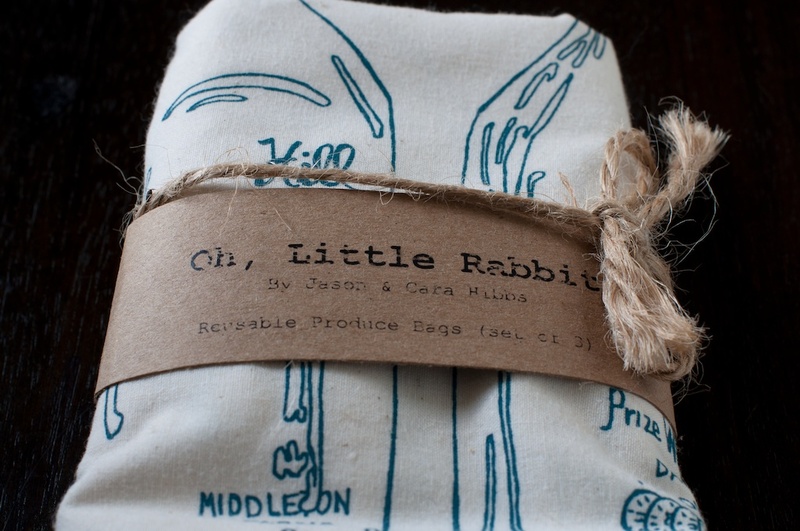 Oh Little Rabbit makes a fantastic collection of towels, napkins, produce bags, and totes. 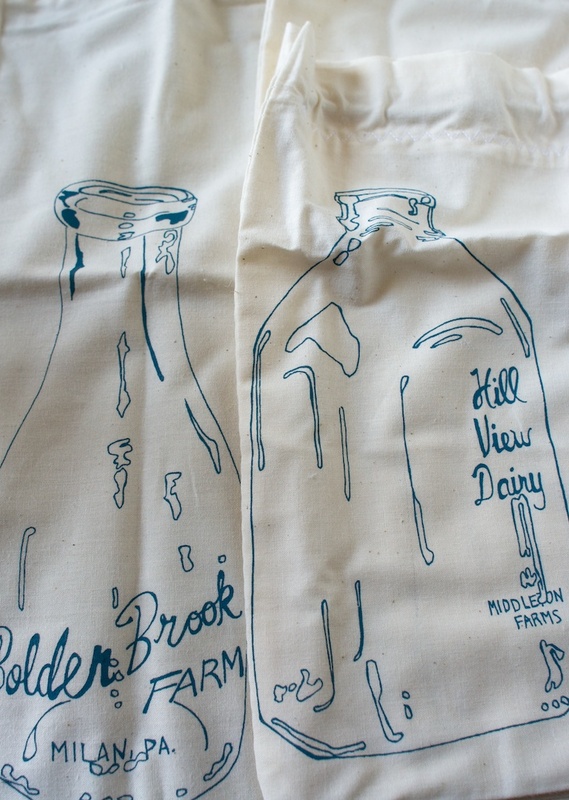 I'm eying the dairy cow produce bags, as well as the bunnies, mason jar, cameras, and bicycles bags. Be sure to visit Oh Little Rabbit's Etsy store and Facebook page for more information.